worn through out the day or if you are a trick or treat chaperon and aren't planning to dress up. I hope you like this spooky Halloween makeup. 1) First off I used a buffing brush to apply my matte foundation. I then applied my concealer under the eyes. 2) Then I blended that out with a damp Beauty Blender. 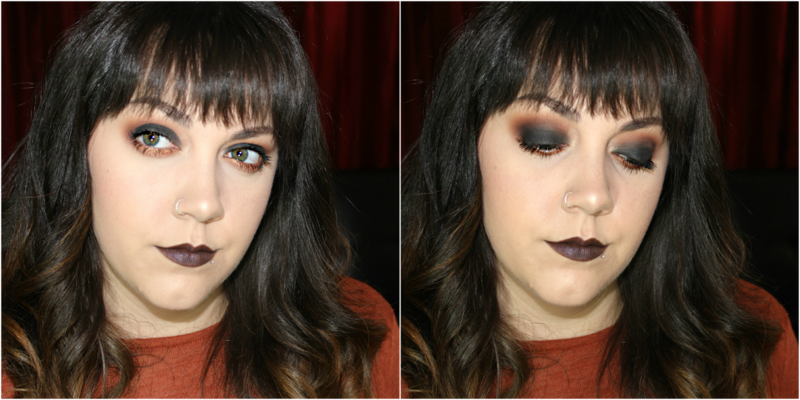 3) I set the look with Incandescent Light from the Houglass Palette for a glowing matte look. 4) I filled in my brows with Dipbow and an angled brush and then went through with Clear Brow Gel. 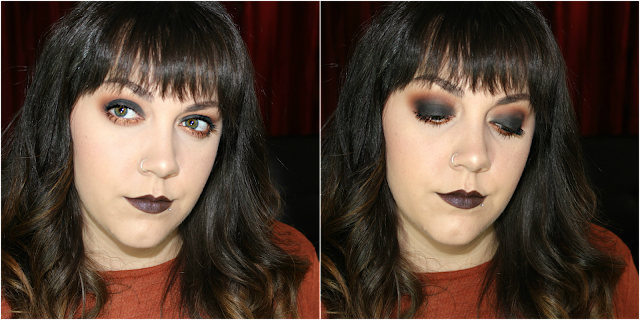 5) I used the grey toned shade from the KVD Shade & Light Palette. 6) After priming my lids, I took the shade Blurr from the Dark Matter Stack (a peach shade) and blended it out and the crease on a fluffy brush. 7) I followed that up with the shade Unseen (an orange toned, medium brown) slightly lower than that and blended them together. 8) Then on a flatter fluffy brush I blended Enigma (a brick toned, rich red) into the socket of my eye. I made sure to not go to high into the crease. 9) I then went back in with Unseen and blended out the edges and created a very rounded eye. 10) I then placed Dark Matter (a jet black shade) all over the lower lid space in pressing motions on a flat brush. I then too a mix of Enigma and Unseen and blended the socket line with the flatter fluffy brush. 11) Then I took a mix of Blurr and Unseen on a pencil brush and ran it along the lower lash line, taking it down quite low. 12) I then took a mix of Gold (metallic, rich, yellow gold) and Garnet (metallic, rusty, brick red) from the Lorac Pro Palette on a fin angled brush and blended that along the lash line, not going as low as I did with the matte shades. 15) I also used Champagne Pop for my inner corner of my eye and brown bone highlight, keeping the look very warm toned. 16) I put Piaf (matte brown with lilac shimmer) on my lips for a finished look. I think it could be toned down if this was too much for you. You could keep the black just along the upper lash line, smudged out instead of all over the lower lid. With that and a neutral lip you would be set. If you don't have all these products you can for sure use what you do have. from you! I hope that this has given you some ideas for this October 31st!